Information The Dynamite Trail is a 10 km trail that runs between the Chester Connection Trail to the East and the Bay to Bay and Adventure Trail in the Town of Mahone Bay. 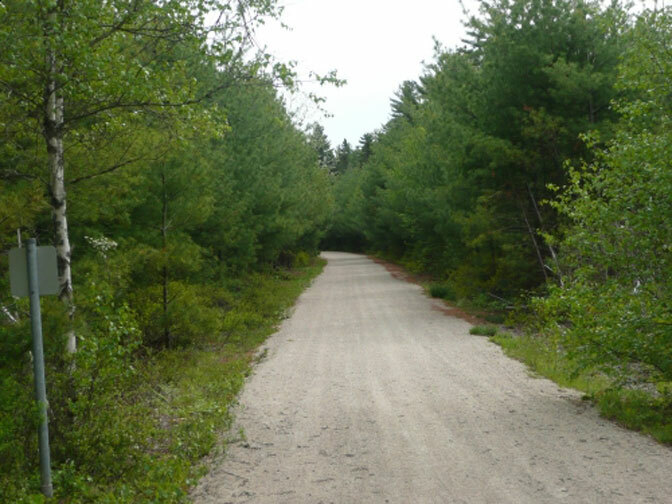 Access includes hikers, bicycles, ATV’s, snowmobiles, skies, and horses. 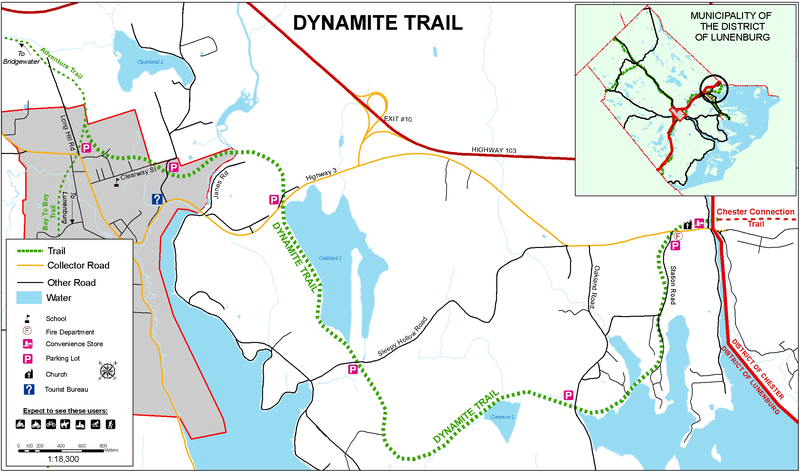 In January 2013 the Dynamite Trail was declared open by the Nova Scotia Department of Natural Resources. This has been the Association’s goal for 13 years and it is the first trail in the Municipality of the District of Lunenburg declared open by the Department. In September, the official opening took place when Mayor Don Downe cycled through a ribbon and led a group of cyclists to a celebratory barbecue at Geoff’s Landing near Oakland Lake. This was a great event for all who have spent so much volunteer time getting the trail to this standard. The DTA directors want to extend thanks to those volunteers, trail donors and sponsors who made the day such a success. The construction of the trail is completed, but the on going task of managing and operating it continues. Maintenance of the trail is now the top priority of the Association. The trail edges must be mown each year to control the vegetation. To properly maintain the trail surface and reduce erosion, grading should also be carried out annually. Trail maintenance and upgrades will require funding from many sources. The Municipality of the District of Lunenburg, Off Highway Vehicle Fund, Health and Wellness Promotion of the Department of Health, corporate sponsors and private donations have contributed over the years. All users of the trail are encouraged to help by joining yearly and making a voluntary donation to the Dynamite Trail Association. Membership is $10.00 and each membership, along with donations, helps to maintain the trail - a small price to pay for use of such a wonderful resource. In October 2013, the first annual Dynamite Trail relay race was held. This was an enjoyable event for all participants and organizers. The second annual relay is scheduled for Saturday in October 4, 2014. As a fun family event, parents, children and friends can enter a team in one of four categories. Now is the time to get in shape and compete. Besides providing an enjoyable time for all, funds were raised for the Dynamite Trail Association and everyone left with a prize. Membership $10/year shows your support for this project. Metre Programme $40 will purchase a metre of trail, tax receipt will be issued. Sponsorship We acknowledge corporate and private sponsors. Construction Have you skills to offer? Administration How about becoming a director ?